Eugene's Blog: Raise the Castle! In order to enjoy Raise the Castle! it's important to realize what it's not. Despite the main character being a sixteenth century warlord named Ondaiji, it's not a samurai flick. Despite Ondaiji showing up in the modern day, it's not time travel. Despite a haunted cave, a witch, and spirit possession, it's not horror. It's an "independent" film, meaning it was made independent of a sizable budget. It's more like somebody decide to film the local road show, which is what it is. Raise the Castle! belongs to that genre of quirky, feel-good films about the guy in a small town who gets a crazy idea and everybody pitches into make it happen. 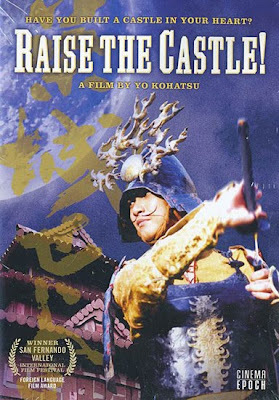 In this case, the soul of the warrior Ondaiji possesses the town nerd, who then dons samurai armor (stolen from the local museum) and commands (in the Japanese equivalent of Shakespearean tones) the townspeople to rebuild his castle. That not being in the budget, they recommend making it out of cardboard boxes instead. And merrily set to work. This has got to be one of the most unintentionally meta films I've seen, a movie about a guy who can't build his real castle and so makes one out of cardboard, made by a guy who can't afford to build scale sets and so makes them out of cardboard in the high school gym. In both cases, they get the townspeople to pitch in and make a party out of it. There is one campy special effect that's even better because it's campy. I didn't notice most of the digital mattes, a tribute to how sophisticated desktop editing software has become. The acting (local stage talent) is good and Yo Kohatsu's direction is equal to the task (he wisely keeps the camera fastened down most of the time). Lurking beneath the goofy, sweet surface is some real depth. The local historian learns to his chagrin that sometimes you "print the legend." The answer to an architectural puzzle makes a clever (and respectful) nod to Christianity (during the Warring States period, a small but influential number of local warlords were devout Christians). All in all, the whole thing can be taken as an anthropological treatise about how local traditions and town festivals get started in the first place. In the last scene, as the mayor surveys the big cardboard mess and gripes to his lackeys and wonders who to blame it on, the president of the Chamber of Commerce rushes up to him and exclaims, "This was so much fun! Let's do it next year!" That's what "community" really comes down to in the end--a big mess worth making on a regular basis.